We can’t believe it but the end is here – today is our last day in the Three Kings, we’re off at 9pm today but before we set off I wanted to tell you a bit about what has made this expedition work so well. Everything about this expedition is a collaboration. 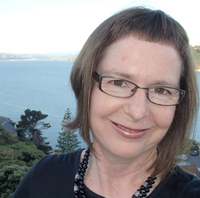 It’s a collaboration between different institutions – Auckland Museum, Te Papa Tongarewa, NIWA, University of Auckland and the University of Queensland. It’s about marine biologists who study different things co-operating together, sharing samples and collecting for each other. For example, Nik came back from a fish collecting dive today with a new starfish for the invertebrate team, and the seaweed team let the invertebrate team check out some unusual deeper water marine algae in case there were interesting creatures hiding amongst the leaves. 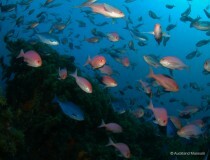 And, most importantly, it’s a collaboration between the scientists and the hard-working crew of the Braveheart. Without them we wouldn’t be able to work up here at all. They drive the big boat and the three little boats, in all weather and sea conditions, get us and our dive gear safely in and out of the water, they cook us great meals AND they do the dishes, and much more. Here is a snapshot of what’s been happening on deck in the last hour. 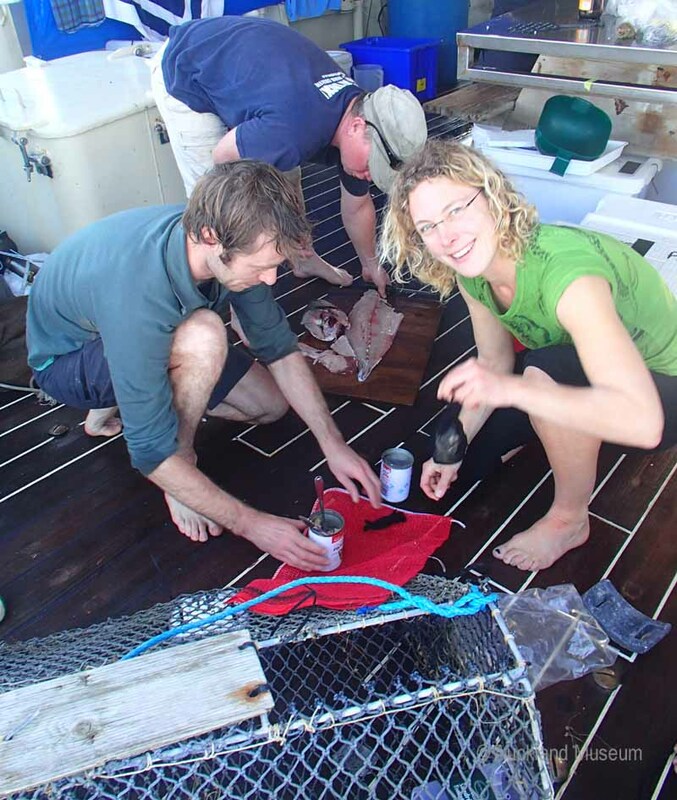 Kareen and Vincent have been getting a hagfish trap and an isopod trap ready. The hagfish trap is what you can see in front, and the pair are just baiting it with pilchard catfood. The idea is that hagfish (which are so slimy they are also known as snot eels) can crawl into the trap but can’t get out. The isopod trap is a tube tied to the side of the big cage, and it contains some seafood catfood along with a glowstick, so it will both smell nice and be bright and interesting, and hopefully entice some hungry or curious isopods (which are crustacea a bit like garden slaters). 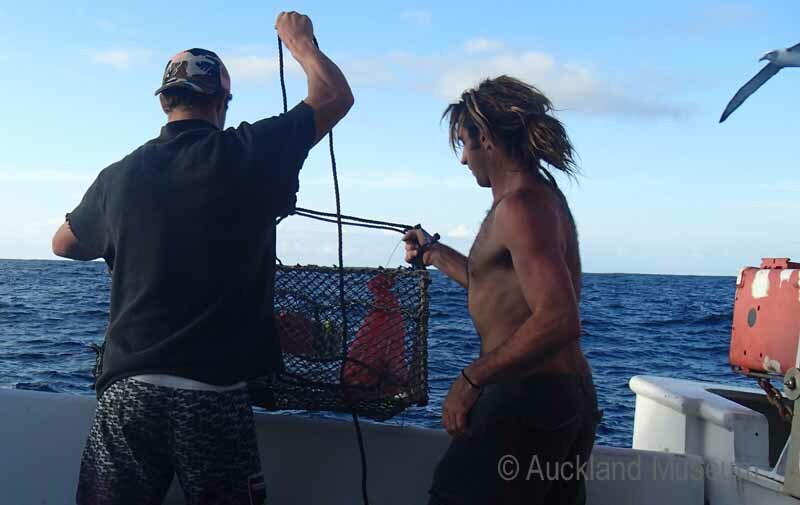 Here crew members Dan and Karl are about to drop the hagfish trap over the back of Braveheart. The trap has lead weights so it will sink to the seafloor 300 metres below and stay there for a couple of hours, before it is pulled back on board by the rope that is attached to it. 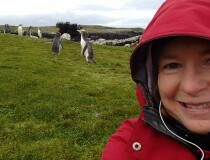 I like the albatross that half came into the photo as I was taking it! 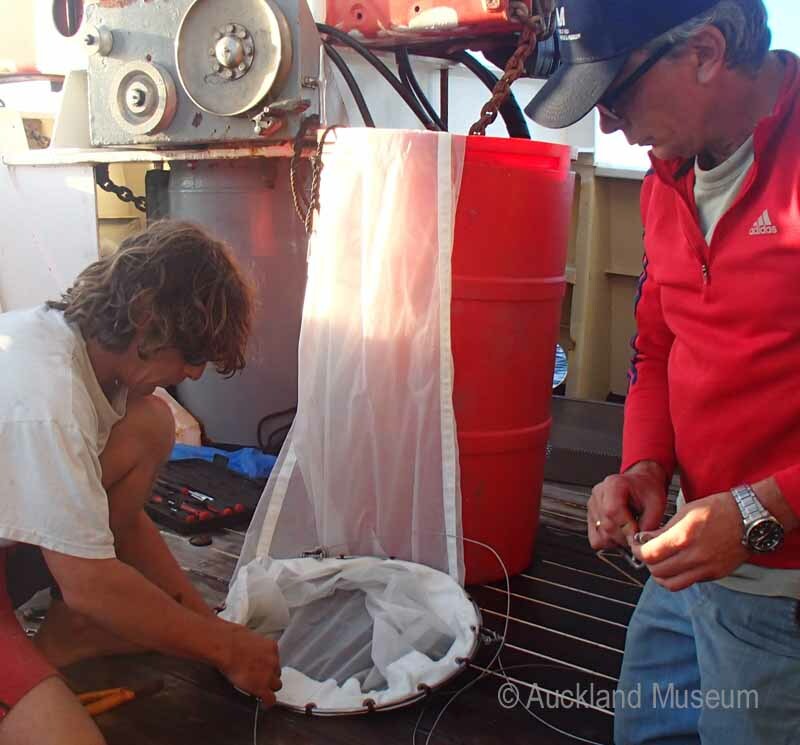 We are trying to collect material for scientists who couldn’t make it on the trip, and here crew member Steve and Tom are rigging up a plankton net. It is a very fine mesh net that will be towed behind the boat for a while and hopefully gather some interesting material for Mary Sewell at the University of Auckland. 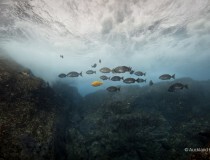 And of course they say that an army marches on its stomach – well it’s certainly true for divers. 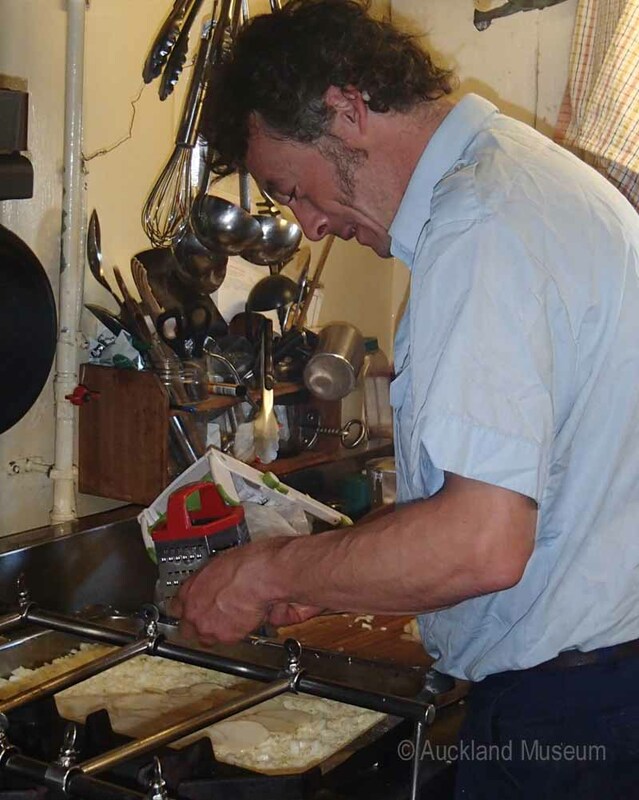 Here is Charlie the cook preparing scalloped potatoes in his little galley – just another delicious Braveheart dinner to look forward to! Basically, this is a bit like our Three Kings Oscar acceptance speech and we want to thank everyone that has made it possible. And the other people we want to thank – even though it’s not all over yet! – is you, the followers of our blog. Having you along on this trip – asking us questions and telling us how much you like the photos and videos and even helping us identify what we’re seeing – has made it an incredible experience for all of us. Stay tuned because there’s a bit more to tell you yet but we just wanted to get our ‘thank yous’ sorted because you’ve all helped to make this expedition a wonderful project. I really appreciate the effort you have put in to make this commentary. I’m in my 80s but still like to know what is going on. A very interesting excursion. Thank you for making these photos and stories available to interested people like me. Thank you so much for the great great blog . It’s was super to follow from Belgium the adventures of the brave heart’s team. Bon voyage de retour.